Spec-Ops scalpel with seamless weapon suppressor incorporates generations of modification! 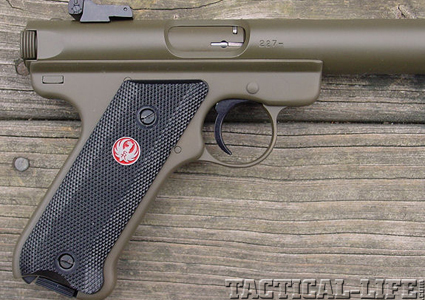 When AWC developed the Amphibian S, it was the first commercial venture into the manufacture an integrally suppressed small caliber semi-automatic pistol since the days of the American OSS (Office of Strategic Services) and the British SOE (Special Operations Executive). In another time, these clandestine services used the HiStandard and occasionally the Colt Woodsman pistols made just for these organizations to finalize negotiations with hostile opposition—usually privately and on a one-on-one basis. Those guns were fitted with Maxim-type muzzle suppressors as they were known then; some were in-line tubes and some were eccentric tunnels. Their internal components were wire mesh discs, fine rolled screen wire, and washers and baffles. Sophistication brought on by time, mission requirements, and noise suppression science has brought us to the era of the AWC Amphibian S.
The Amphibian S is a two-part unit. 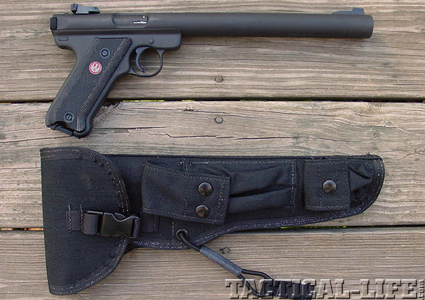 The host weapon is the latest current production Ruger Mk. III pistol. 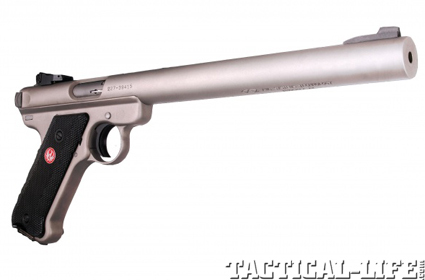 Now some 60 years in production, the Ruger semiauto .22 Long Rifle pistol is the near-standard of the industry when it comes to an affordable handgun appreciated by shooters in every category imaginable. The current model has high-visibility adjustable sights, a frame-mounted American-style magazine release and a loaded chamber indicator. Robust beyond its competitors, every Ruger to be used as an Amphibian S is still detail-stripped and “blue printed” by AWC for consistent reliability with standard and high velocity cartridges. Neither slide locks nor other bolt-hold-closed mechanisms are needed to further contain escaping gas or preclude mechanical clatter; the internal component parts are a symphony of sophistication reduced to calculated simplicity. Not so much by radical departures from previous manifestations but rather by informed steps forward—there have been 13 variations over a 29-year span—the Amphibian S has become the most advanced and sought-after special weapon of its type in the world. It is in service with the SEALs for pest control, in spook and covert ops military arsenals, police and law enforcement special unit armories, and in private gun safes of good neighbors who enjoy target practice or just plinking pine cones and tin cans. Today’s Amphibian S was developed to address wanted refinements in three specific areas: weight, accuracy and extended service life, and according to AWC the product exceeds expectations. Curiously, no special attention was paid to further noise suppression in this evolution although that’s an area that suppressor makers can hardly resist tweaking. The improved accuracy is achieved with the new interior design, and this in turn contributes to the extended service life. The Amphibian S suppression chamber measures 7 inches x1 inch and uses 304 stainless steel, 606 1T-6 aluminum, and titanium for the tube and component parts to accomplish the weight reduction goal. 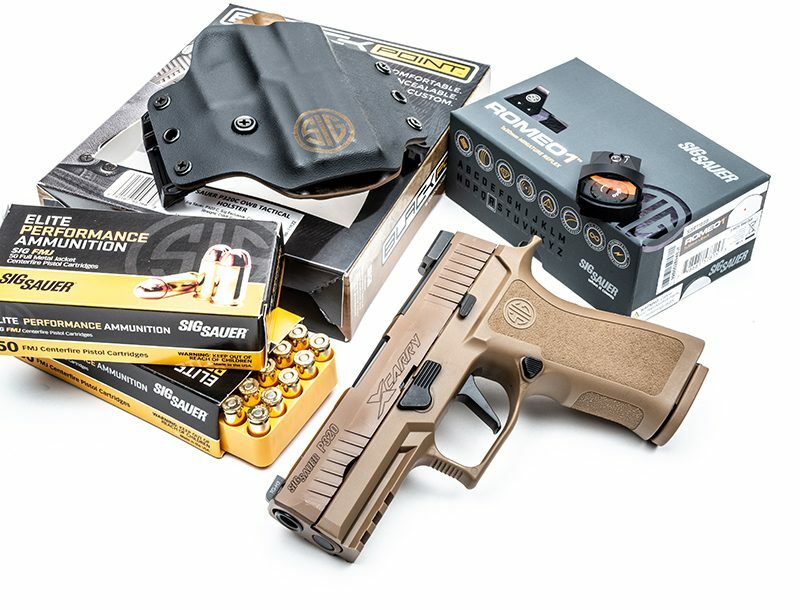 This part of the package is more or less seamlessly mated to the Ruger host weapon regardless of the owner’s choice of a Tactical Black, Olive Drab, or Flat Dark Earth finish. 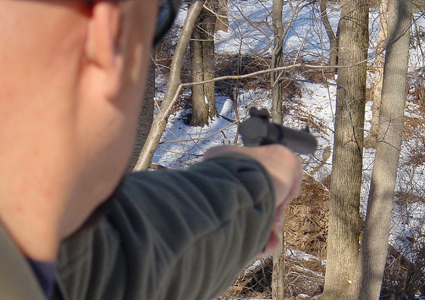 The principal function of a firearm suppressor is to reduce muzzle blast, the occurrence precipitating the original sins of noise and flash. The Amphibian S flash signature has been sufficiently diminished by AWC’s proprietary baffle stack to the point that artificial measures are rarely necessary to mask the shooter’s position, even from a cold muzzle on the first shot. Night vision devices don’t bloom and a shooters’ position is not illuminated. Inducing an artificial environment is strictly shooter-optional. In discussions of suppressors, noise cancellation is usually addressed first. With an Amphibian S the sound pressure level from muzzle blast is low enough to disguise the point of origin well within the early-mandated distance of 30 feet with a handgun. This isn’t TV quiet, but with standard or high-velocity ammunition (which is recommended; subsonic ammunition is not) the perceptible report is noticeably softer and far reduced from a Mk III that has not been suppressed. There is no need for hearing protection even on cool nights when sound is magnified in underground garages, controlled concourses, aircraft hangers, on private yachts or in other confined areas. There is no need to induce an artificial environment into an Amphibian S, although liquid or petroleum based additives may make the report quieter. 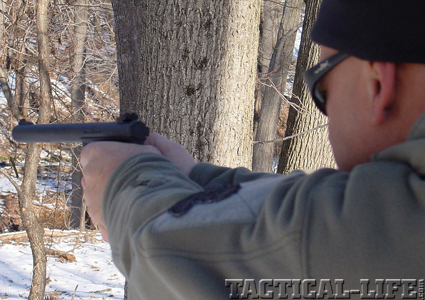 Slide clatter, a notable but relatively insignificant aspect of shooting a suppressed pistol, can be addressed by an Amphibian S shooter who knows alternative gun handling procedures. Many who appreciate exotic weaponry consider a suppressed .22 caliber pistol to be a starter weapon into this echelon of arms collecting, and rightly so. But make no mistake: the Amphibian S is classified as ordnance, an implement of war. Private owners may be content to subtly blow off steam at their favorite shooting range while others may need to dispose of pests and scavengers or chase varmints through the woods without disturbing the neighbors. This gun will add a new dimension to their weapons locker. Professional operators are a different matter. Their dynamic for the Amphibian S extends to CQB tactics engaging hostiles in active shooter situations, rescuing barricaded subjects or neutralizing hostage takers. Crowd and riot control situations have been decided for the good guys who have shot out street lights, shattered windows, and Swiss-cheesed empty cars as distraction targets. There is a home for an Amphibian S in every armory. 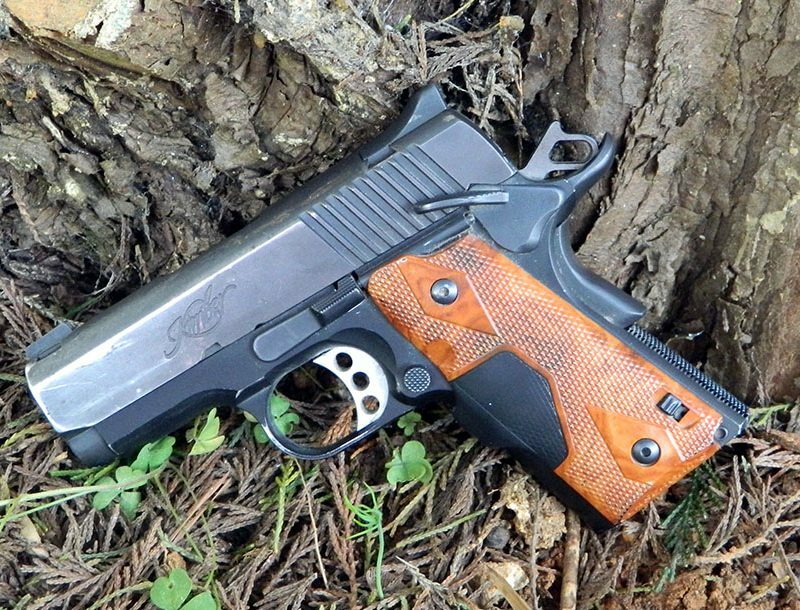 In hand the Amphibian S feels like, well…just what it is—a familiar Ruger Mk III but with a longer sight radius. If your Ruger pistol is of this genre you will find yourself a piece of a second off-time while you search for the front sight for a quick shot. It’s a little further away than you’re accustomed to, but that sensation melts away in the course of a couple of magazines. It is replaced by a curious sense of both awe and confidence in the realization that this pistol has risen to a new dimension where nothing has been diminished but the weapon’s report. There is no difference in apparent recoil, no increase in muzzle flip, no changes in handling characteristics or operational procedures, and no hearing protection is needed. As to reliability, throughout the tests no faults occurred with the weapon. The piece was shot in serials of 2, 3, 4, and 5 rounds without a malfunction. Even Dutch loads, shot more rapidly than could ever be considered necessary, did not cause the Amphibian to falter. To the unprotected ear the weapon produces more of a mechanical click than the sound of gunfire. The loudest report comes on the last round and that is due to the action locking open on an empty magazine. 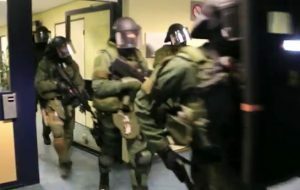 Netherlands’ Unit Interventie Mariniers counter terror exercise in Rotterdam (video).